14. Do I Love You Because You’re Beautiful? Richard Rodgers and Oscar Hammerstein II came together professionally at what seems like the perfect moment in their careers – certainly at the perfect moment for the American musical theater. They were very different men in style and personality. But their understanding of their collaboration was as wise and perceptive as it was successful. Perhaps, by 1942, they were mature enough and seasoned by enough professional success and failure that each immediately grasped the opportunity presented by the other. Rodgers and Hammerstein have remarkable bodies of work with other collaborators, but their work together – primarily on nine Broadway musicals, one film musical and one television musical, over seventeen busy years – is incomparable in its enduring beauty, its inexhaustible optimism and its rich impact on our culture. In 1940 Lawrence Langner, founder of the Theatre Guild, and Theresa Helburn, its managing director, approached Richard Rodgers and Lorenz Hart (both Guild alumni, who had contributed the songs to the 1925 and 1926 editions of The Garrick Gaieties) to propose a new musical based on Lynn Riggs’s play Green Grow the Lilacs, which the Guild had staged a dozen years earlier. Coincidentally, Oscar Hammerstein II had tried, to no avail, to convince his frequent partner Jerome Kern to undertake the project. Now an enthusiastic Hammerstein joined the Rodgers and Hart team as librettist (the three had known each other from their college years at Columbia University). Hart, however, was in poor health and had to bow out, so Hammerstein assumed the role of lyricist as well. Thus was created one of the most successful and prolific partnerships in the American musical theater. The first show the two men wrote (based on Lynn Riggs’s play and retitled Oklahoma!) premiered at the St. James Theatre in New York on March 31, 1943, and went on to become the longest-running Broadway musical of its era with an impressive 2,212 performances, a record it held for fourteen years. More significant, it ushered in a new era in musicals and paved the way for what was one of the most fertile periods in Broadway history. In addition, Rodgers and Hammerstein wrote Carousel, which opened at the Majestic Theatre on April 19, 1945 (890 performances); Allegro, also at the Majestic on October 10, 1947 (315 performances); South Pacific, at the Majestic on April 7, 1949 (1,925 performances); The King and I, which arrived at the St. James on March 29, 1951 (1,246 performances); Me and Juliet, again at the Majestic on May 28, 1953 (358 performances); Pipe Dream, which bowed at the Shubert Theatre on November 30, 1955 (246 performances); Flower Drum Song, which followed at the St. James on December 1, 1958 (600 performances); and The Sound of Music, which settled at the Lunt-Fontanne Theatre on November 16, 1959 (1,443 performances). In 1945 Rodgers and Hammerstein also contributed the score to a screen musical, State Fair, and in 1957 wrote the songs for a television musical, Cinderella, starring Julie Andrews. The partnership ended with the death of Hammerstein on August 23, 1960. In his comprehensive study The World of Musical Comedy (Grosset & Dunlap, 1960), Broadway historian and chronicler Stanley Green writes, “When Rodgers first proposed to Hammerstein that they collaborate on the musical version of Green Grow the Lilacs . . . he believed that their basically similar outlook on the theatre and on life itself would help to make theirs a harmonious partnership.” Rodgers’s melodic sense and Hammerstein’s lyricism blended together beautifully, resulting in songs that ring memorably and are attractively crafted. Deceptively simple, they required, however, a great deal of work, particularly from Hammerstein, who was known to spend hours, sometimes days, agonizing over the use of a rhyme or a word, and who frequently expressed frustration over his partner’s evident ease at creating “instant” melodies. 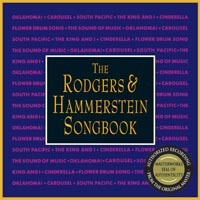 Since The Rodgers and Hammerstein Songbook was created in 1993, to celebrate the fiftieth anniversary of the partnership, the Masterworks Broadway catalogue has expanded to include several cast recordings that were previously unavailable. This new edition of the Songbook has been revised to include essential performances from great recordings of Oklahoma!, Carousel, South Pacific, The King and I and The Sound of Music, as well as songs from the rarely heard original cast recordings of Allegro and Me and Juliet. It concludes with Theodore Bikel’s performance, from the original 1959 Broadway cast recording of The Sound of Music, of the last song Rodgers and Hammerstein wrote together – “Edelweiss,” completed shortly before Oscar Hammerstein II died in 1959. It is surely not their greatest accomplishment, but “Edelweiss” is an apt signature for them. The melody is as direct and crystalline as it is unforgettable, in Rodgers’s beloved “waltz” meter. Hammerstein’s wistful, compact lyric disarms with its simplicity and sincerity. Each is unimaginable without the other.